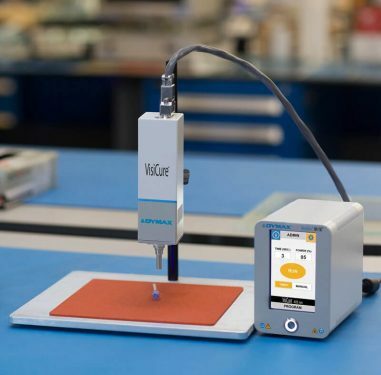 UV curing spot lamps process UV and visible light-curable adhesives and coatings very quickly – typically in less than 10 seconds and often in just 1 second. We recommend spot lamps for R&D laboratory environments as well as low- and high-volume production applications in medical, industrial, electronics, automotive, and optical industries. The handheld IUV101 LED 370nm Spot Lamp offers portability, precision and power for concentrated curing of UV Light Curable Adhesives. The Dymax BlueWave® MX-Series LED UV spot and flood curing system provides manufacturers with the curing flexibility of other Dymax systems but in a small, efficient design with expansion capabilities. The Dymax BlueWave MX-150 LED UV spot curing lamp system provides manufacturers with the curing flexibility they need, in a smaller, more efficient design. With this new design, the system can be truly tailored to users’ curing needs – allowing them to choose from three different wavelength LED emitters (365, 385, or 405 nm) so optimal cures are achieved. The Dymax BlueWave LED Spot Curing System offers many advantages over conventional spot curing systems, including no bulbs to change, cool cures, no warm up and constant intensity for thousands of hours. It generates curing energy using high intensity LEDs. The relatively narrow frequency band produced by LEDs generates cooler curing temperatures. The Dymax BlueWave QX4 high intensity LED UV spot curing lamp features all the benefits of LED curing technology in a small, versatile unit. This system comprises a controller with a foot switch and up to four LED heads. The Dymax BlueWave® 200 UV curing spot lamp offers very high intensity and simple operation – the most versatile, user-friendly and reliable UV spot curing lamp available. This spot curing lamp emits energy in the UVA and visible portion of the spectrum (300-450 nm) for light curing of adhesives, coatings, and encapsulants. Copyright © 2019 INTERTRONICS. All rights reserved.